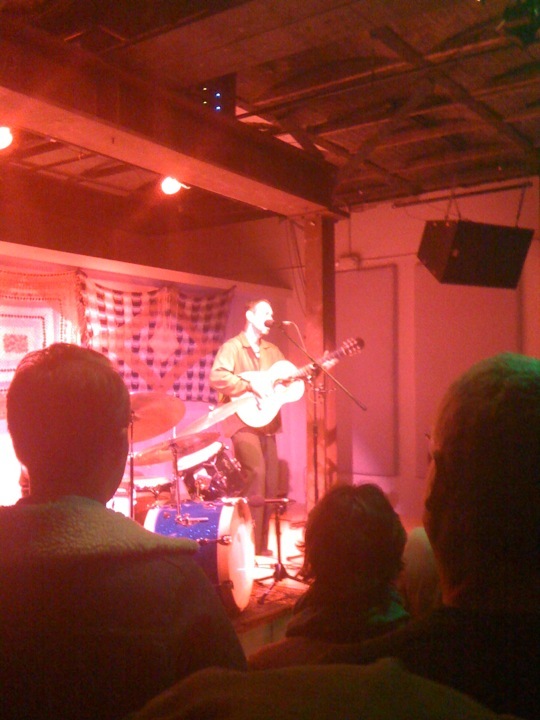 Jonathan Richman entertains the crowd at Portland, Maine's Space Gallery with songs from his latest release, "O Moon." Ask the folks who live and work in and around Portland, Maine, and they’ll tell you that the city’s burgeoning arts scene plays a large role in what makes Portland such a cool little town. Of course, there are many other reasons, but the astonishing variety of artists, musicians, actors, writers, poets and playwrites who call Portland home, or pass through as they’re doing shows here, produce an aura of creative possibility that has become part of the fabric of life in the greater Portland area. And OTTO Pizza‘s Arts District Shop at 576 Congress Street is right in the heart of the action — and because of that, every once in a while, something happens that allows us to transcend the rhythm of our day-in, day-out lives, step back and wonder at the beauty of it all. Turns out that OTTO Pizza co-owner Mike Keon, as well as a couple of the members of the crew at the OTTO Pizza Arts District shop are big Jonathan Richman fans. The Space Gallery’s only a few doors down, so Mike had sent down a couple of pizzas so Jonathan wouldn’t have to take the stage hungry. To show his thanks, Jonathan decided to stop in with his guitar, unannounced, and play a couple of tunes. Seth Condon, the manager who was on that night, said he wasn’t exactly sure what was going on when Richman came in and started playing. He didn’t announce himself or say anything, Seth said, he just started playing, strolling through both OTTO and ENZO, the attached wine bar, before heading out the door and back down the street to the Space Gallery to do his show. Unfortunately, no one got so much as a photo of Jonathan during his visit to OTTO Pizza but the OTTO contingent that attended the show that night did get a couple of shots of him on stage at the Space Gallery. And, for what it’s worth, if Jonathan Richman’s playing in your town, don’t miss it. He’s a great songwriter who puts on a fantastic show. This entry was posted in Music, Portland Arts District and tagged Jonathan Richman, Maine, OTTO Pizza, Portland, Space Gallery by elshepherd. Bookmark the permalink.